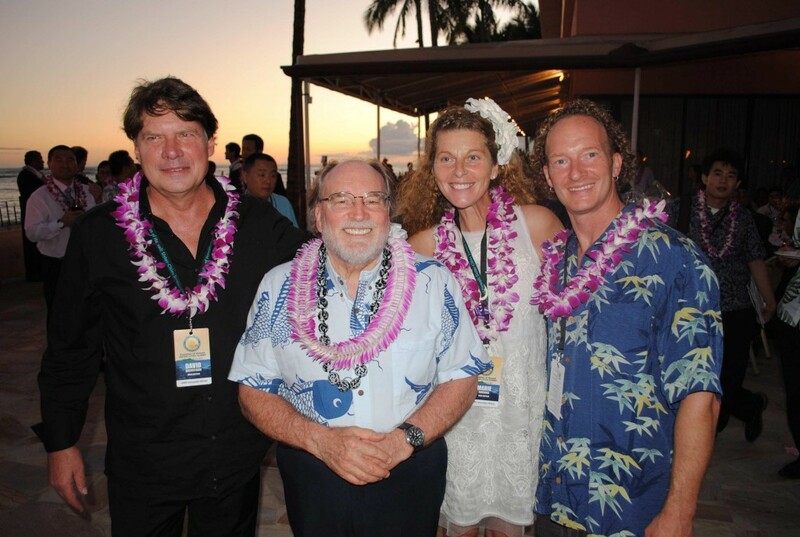 Left to right: Noni Biotech’s Presidents David Backstrom and Marie-Laure Ankaoua, Mayor Alan Arakawa, and Noni Biotech’s Director of Research Paul Nordone. Photo courtesy of Noni Biotech. 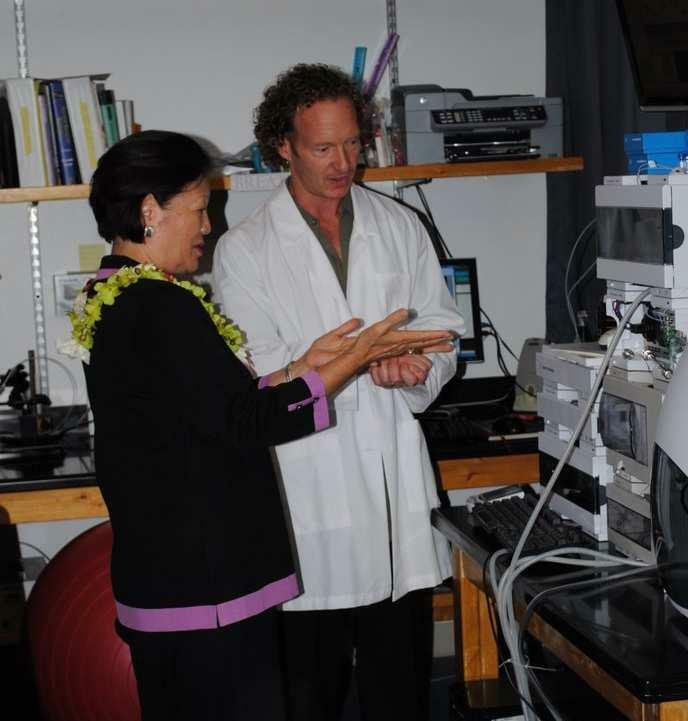 On May 4, Maui Mayor Alan M. Arakawa toured the headquarters of Noni Biotech International LLC and invited the company to join a County of Maui business trip in August to Japan and Korea. The mayor was joined on the tour by Maui County Office of Economic Development Coordinator Teena Rasmussen, Maui County Environmental Coordinator Robert Parsons, Maui Economic Development Board Program Director Tom Liu, and Mimi Hu CPA, principal partner of Levin & Hu LLP. Mayor Arakawa’s visit began with a tour of the company research lab, led by Noni Biotech’s Director of Research Paul Nordone, who explained some of the company’s research strategies and offered samplings of the company’s newest products in development. 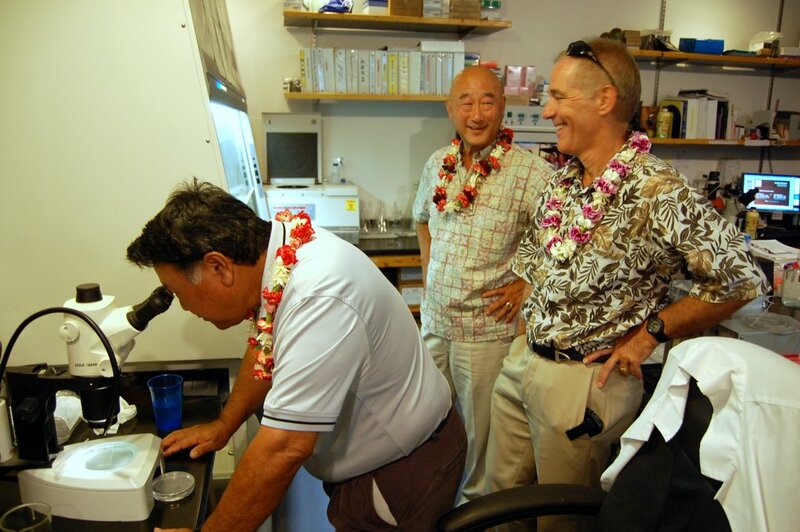 Mayor Arakawa touring the Noni Biotech International laboratory. Courtesy of Noni Biotech. 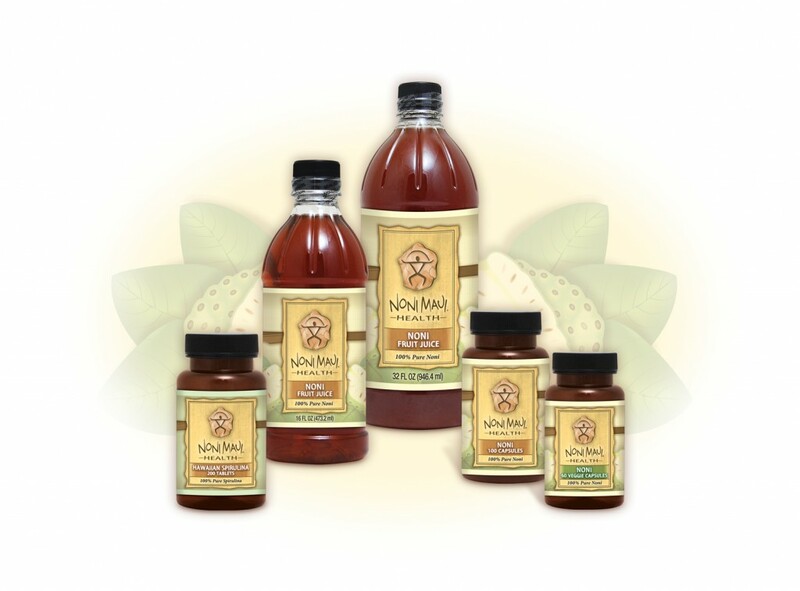 Noni Biotech International currently exports 100% pure Hawaiian noni products and ingredients to over 50 countries under the brand names Noni Maui and Maui Noni. Their achievements have not gone without recognition. 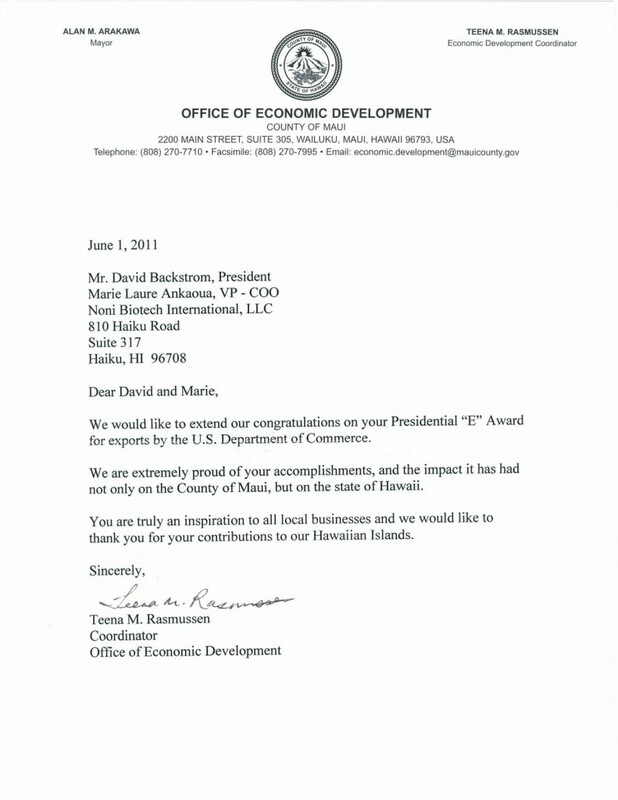 In 2011 the company received the prestigious Presidential “E” Export Award for excellence in exporting. 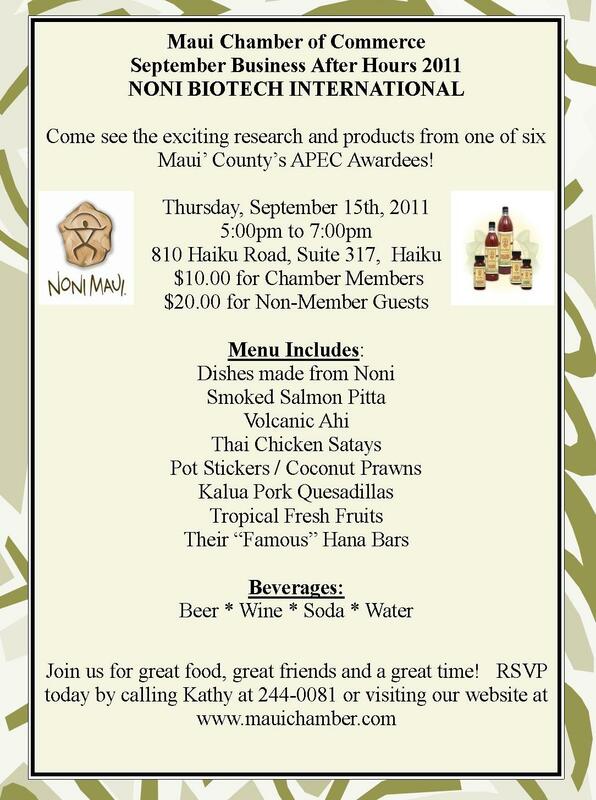 In addition, Noni Biotech was selected as a finalist in the APEC Statewide Business Innovation Showcase in September 2011. 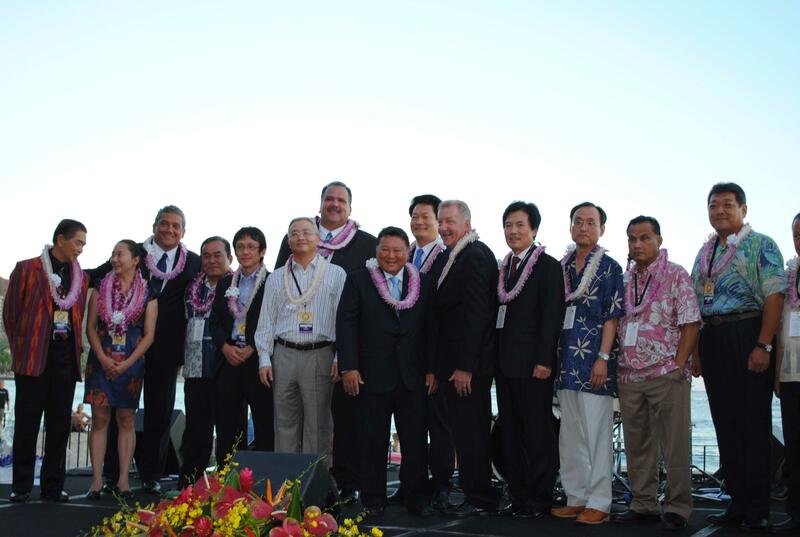 Mayor Arakawa presented the award during the ceremony hosted at the Sister Cities summit in Waikiki. After the morning tour, visitors gathered in the company conference room for a light breakfast and a presentation from Noni Biotech’s Presidents Marie-Laure Ankaoua and David Backstrom. 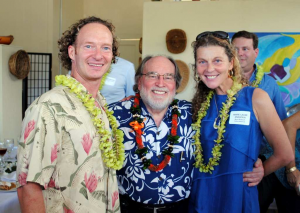 Ankaoua and Backstrom shared more information about the company’s background and their plans for future development in Maui as well as in their farm and factory, both of which are located on the island of Hawaii. 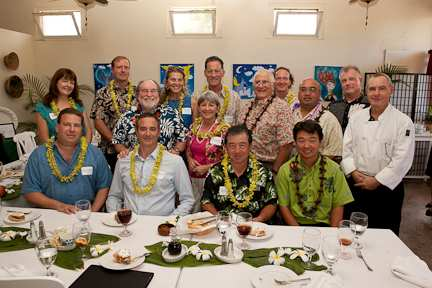 “We feel very honored that Mayor Arakawa took the time to come and visit us. It shows how much he is paying attention to the growth of small businesses in his county,” said Ankaoua, in a written statement. 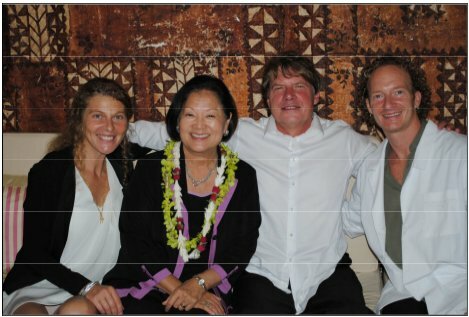 Congresswoman Mazie K. Hirono with Noni Biotech’s Managers Marie Laure Ankaoua (COO), David Backstrom (CEO) and Paul Nordone (R&D). being recognized for the prestigious APEC conference. partners in all 21 APEC member economies. Washington D.C. by Secretary of Commerce Gary Locke, now Ambassador to China. .
development and High technology processing capabilities. 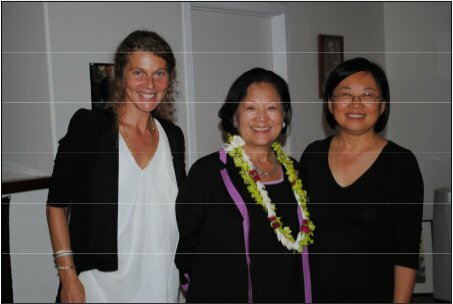 Congresswoman Mazie K. Hirono with Marie Laure Ankaoua, the company Chief Operating officer and Mimi Hu – Levin&Hu LLP, Certified Public Accountant. World Trade Week ceremonies in Washington DC. Noni Biotech International today was awarded the Presidential “E” Award for Exports by U.S. Department of Commerce Secretary Gary Locke at the Department’s headquarters in Washington, D.C. The “E” Awards are the highest recognition any U.S. entity may receive for making a significant contribution to the expansion of U.S. exports. 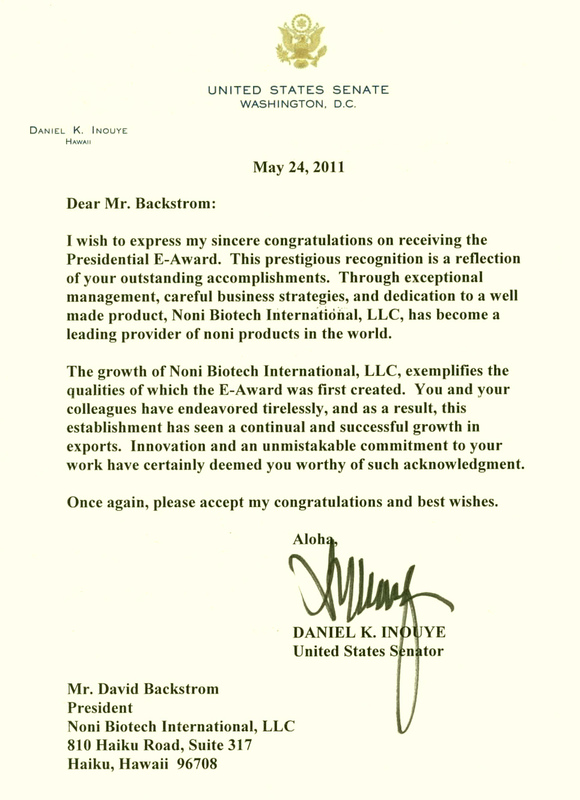 “Exporting continues to be the foundation of our sales growth, and we are honored to receive the “E” Award,” said David Backstrom, Noni Biotech International’s President and CEO. “Our Company has grown significantly in the past few years, doubling sales each year through 2009. Over the past 6 years, export sales grew to nearly 60% of our total sales. Since 2006, we focused mainly on international sales. “Today, our Company ships containers of Hawaiian Noni product to countries throughout Europe, Asia and Africa, and in 2010, the Company continued its expansion abroad, by securing customers from some of the most attractive emerging markets like China, Lithuania, Croatia, Israel, Nigeria, and is in negotiation with countries such as Poland, United Arab Emirates, Thailand, and Malaysia” said Scott Owens, Director of Operations. 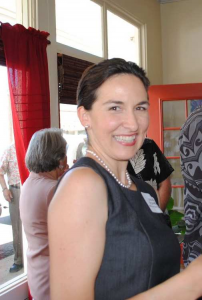 “Noni Biotech International headquarters and R&D lab are located in Maui, Hawaii and has its manufacturing facility in Hilo, Big Island of Hawaii” added Marie-Laure Ankaoua, the Company’s Chief Operating Officer. “The Hilo manufacturing facility helped to spur economic development in a rural area as the Company created new jobs in its Hilo factory on the Big Island. The Company also provided jobs for over 80 Noni far-mers and their families on the Big Island that are selling daily their fruits to be processed at the factory” said Ankaoua. “Noni Biotech International provides its consumers with the highest quality all-natural Hawaiian Noni grown in the pristine Hawaiian coastal environment. 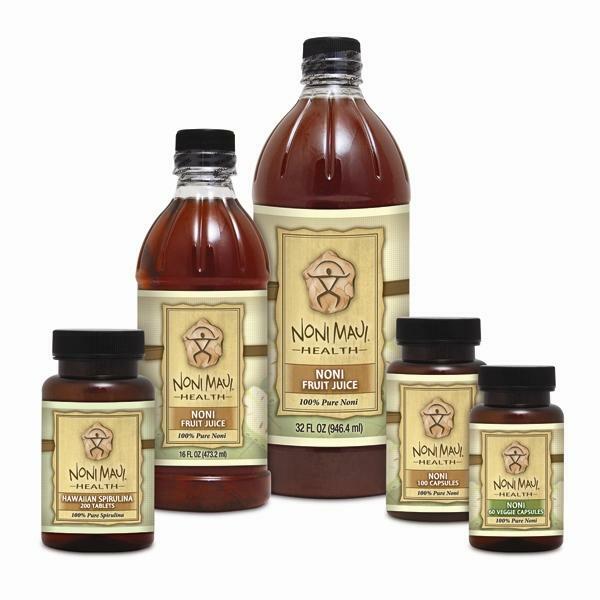 The products include Noni juice, Noni powder and Noni capsules, Noni puree, and Noni concentrate”. “The Company also has a subsidiary, Pacific Biotech LLC (PB) that engages in research and development of Noni extracts and other endemic Hawaiian plants. New scientific discoveries will add value to our worldwide product distribution” added Paul Nordone, VP and Director of R&D. “I congratulate you on your significant export achievement. It is businesses like yours that will help us meet or exceed the President’s NEI goals. 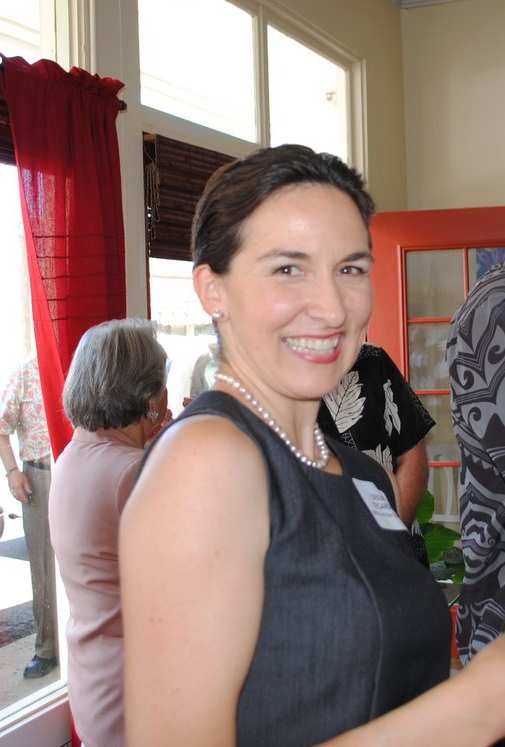 Your firm provides an example we hope more American companies will follow,” Locke added. A business client of the Department’s U.S. Commercial Service, Noni Biotech International has benefited from export counseling, trade shows, market research, and business matchmaking to greatly expand its export sales. While Europe and Asia represents a significant portion of the company’s foreign market sales, the firm does business in several other regions of the world as well. Noni Biotech International demonstrated a substantial increase in the volume of exports over a four-year period, a major criterion for the award. U.S. companies are nominated for the “E” Awards through the U.S. Commercial Service office network in 108 U.S. cities and more than 75 countries which helps U.S. companies export. Criteria for the award is based on four years of successive export growth, usually accompanied by a rising percentage of export sales within total sales. An applicant’s demonstration of an innovative international marketing plan that led to the increase in exports is a significant factor in making the award. 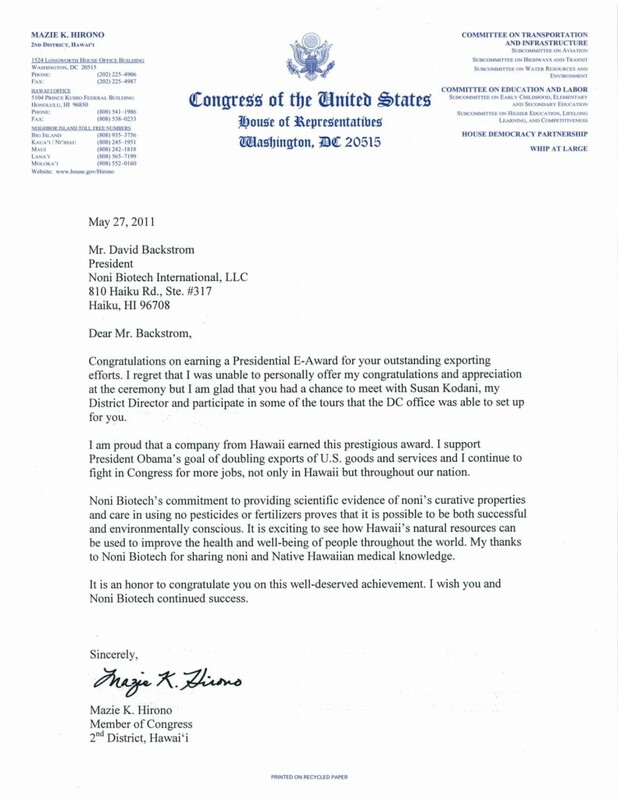 “Noni Biotech was nominated for the President’s E-Award by John Holman, Director of the Hawaii Export Assistance Center, a division of the U.S. Department of Commerce. In collaboration with his colleagues at the U.S. Embassies around the globe, Mr. Holman has been helping the Company the past few years to enter new international markets all over the world” said Ankaoua. All nominations are reviewed by the “E” Award Committee, which is chaired by the Department of Commerce, and includes representatives from ExIm Bank, and the Departments of Labor, State, and Transportation. President Kennedy revived the World War II “E” symbol of excellence to honor and provide recognition to America’s exporters. Thus, the “E” Award Program was established by Executive Order 10978 on December 5, 1961. A total of 27 U.S. companies were presented with the “E” Award at the May 16, 2011 World Trade Week ceremonies in Washington DC. In August 2011, the Company was selected as a finalist for Maui County in the APEC statewide Business Innovation Showcase. 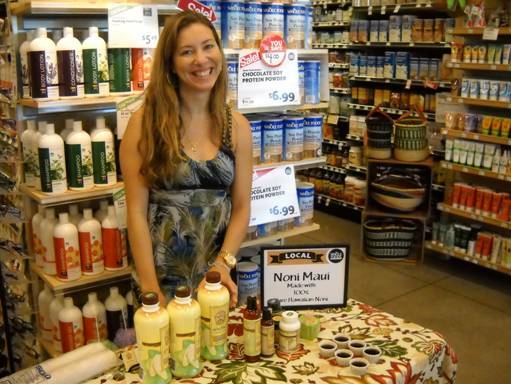 On August 27 2011, Noni Biotech International participated in the Whole Foods “Grown on Maui” Festival. Thank you to all who showed up to support local farmers and businesses! 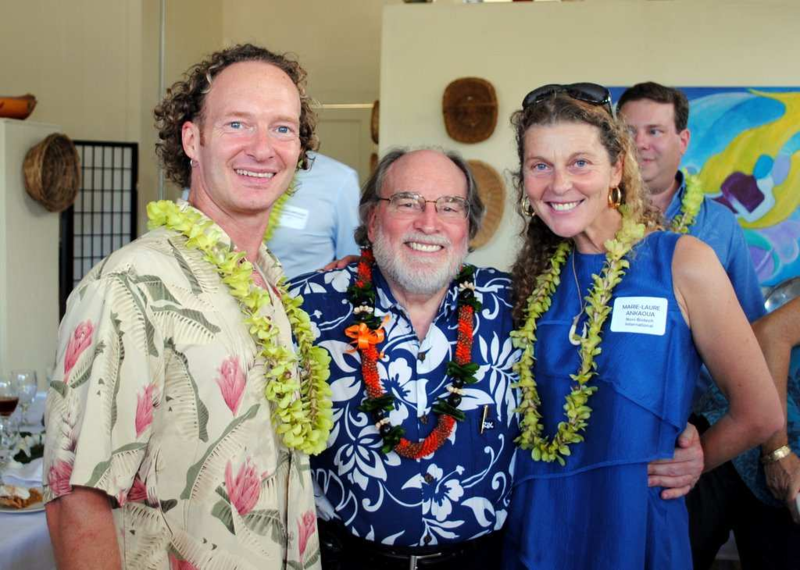 David Backstrom, President and CEO of Noni Biotech International and Marie-Laure Ankaoua, VP & COO, receive the prestigious award at the Governor’s office on the fifth floor of the Hawaii State Capitol building. From left to right: Marc E Rousseau, Esq – Cades Schutte LLP, David Backstrom, President and CEO of Noni Biotech International, Marie-Laure Ankaoua, VP & COO of Noni Biotech International, Governor Linda Lingle, John Holman, Director of U. S. Commercial Service, Paul Nordone, MS. VP of R&D, Noni Biotech International, Mimi Hu, CPA of Levin & Hu LLP. Noni Biotech International Recognized by the U.S. Department of Commerce with Export Achievement Award. The Hawaii Export Assistance Center provided ongoing support for Noni Biotech that allowed the company to make its first sale of a container to a new distributor in South Korea. 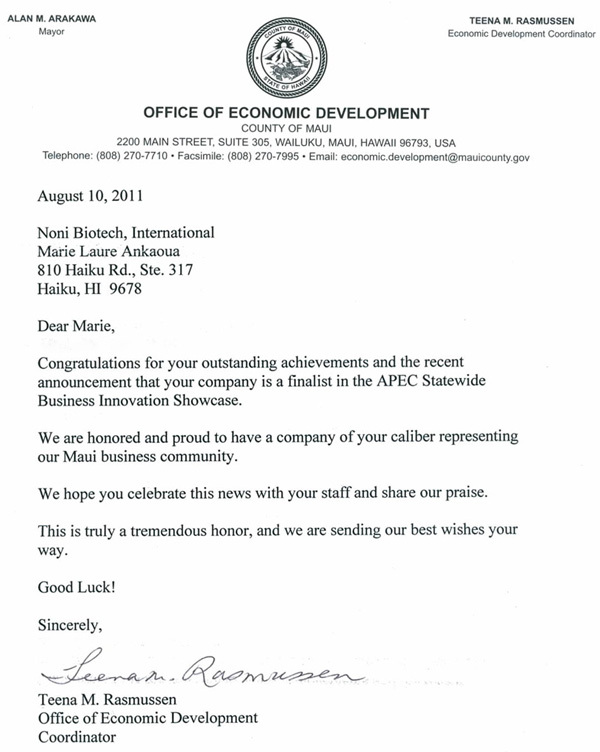 Noni Biotech International LLC (NBI) was awarded on May 19th, 2010 an Export Achievement Certificate from the United States Department of Commerce for excellence in exporting products made in Hawaii. 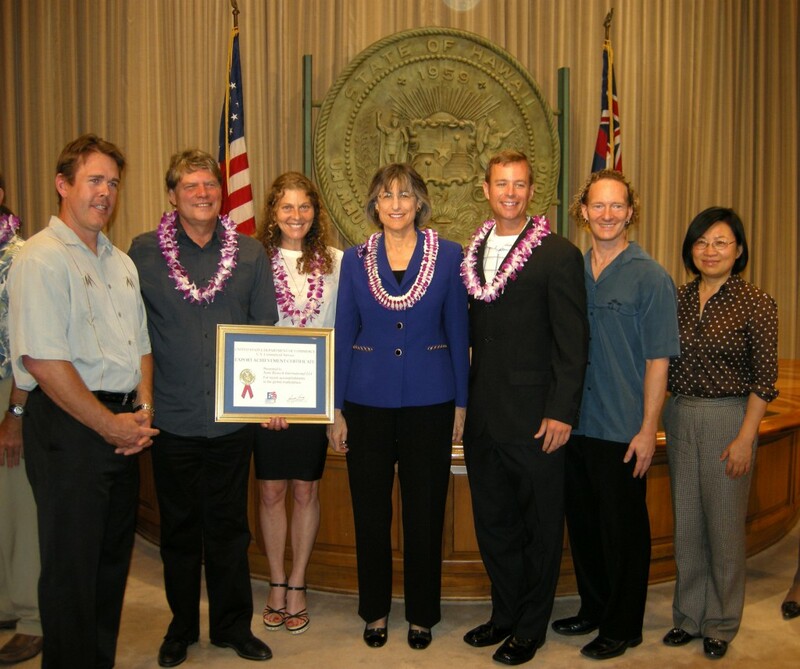 Governor Linda Lingle along with John Holman, Director of U.S. Commercial Service, presented the award, at the Hawaii State Capital building. “We are honored and very grateful for this recognition”, commented David Backstrom, Noni Biotech CEO while accepting the award. “The U.S. Department of Commerce Export Center has been an invaluable partner to Noni Biotech as we worked together to expand the worldwide consumption of Hawaiian made Noni products. The Export Achievement Certificate award signed by the Director General of the U.S. Commercial Service recognizes small and medium sized enterprises that have successfully entered the international marketplace. 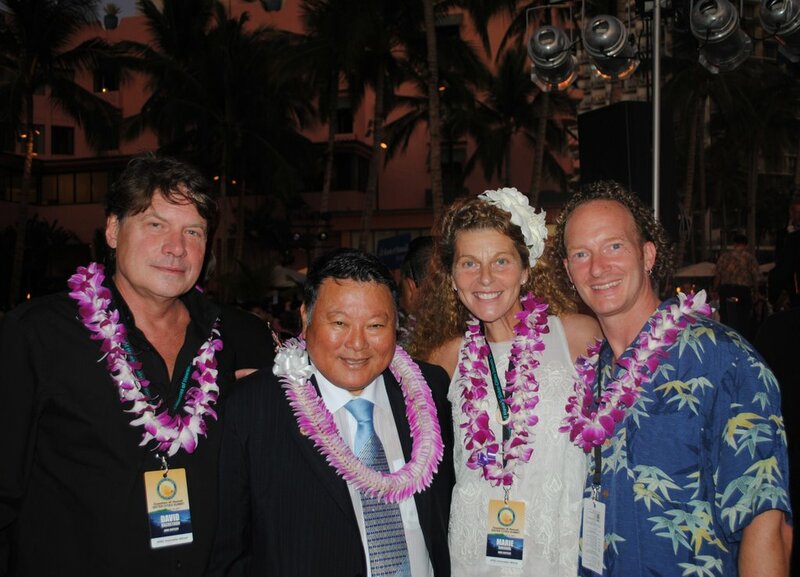 Noni Biotech International investor: Michael T. Moore, EA, CFP – The Jung Financial Group, Ltd.
Noni Biotech International is dedicated to the development, manufacturing and marketing of Noni based products derived from the Noni plant grown in Hawaii. The company also engages in scientific research as well as contracted clinical studies with major U. S. universities and is in the process of isolating and identifying a cancer inhibitor. 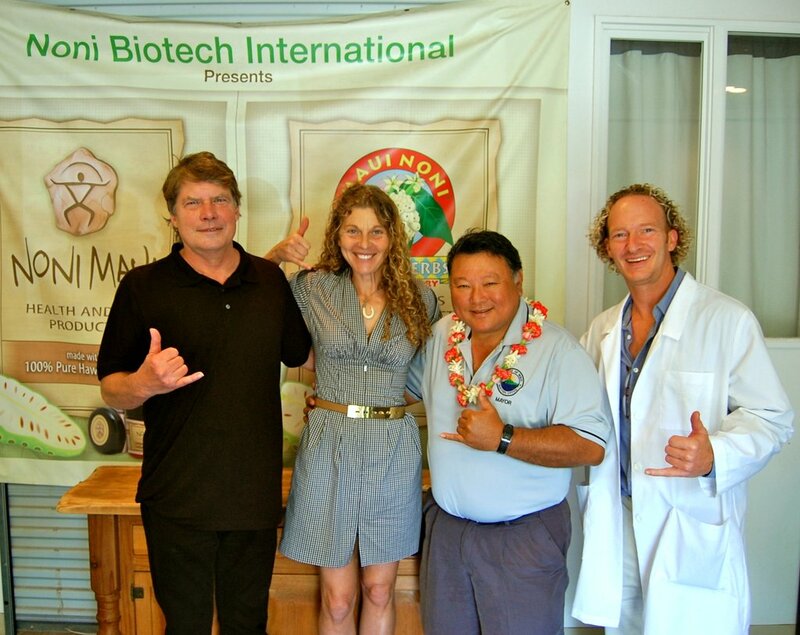 Noni Biotech is currently the largest Noni manufacturer in the State of Hawaii, and the company’s vision is to combine its scientific research with traditional Hawaiian healing. July 23, 2009 — Noni Biotech International LLC is officially announcing the opening of their new processing facility for Noni juice, powders and concentrates addressing the growing international market for Hawaiian Noni. The new facility, located in Hilo, positions Noni Biotech International LLC (dba Noni Maui) as the largest processor of Noni in the Hawaiian islands. Using state-of-the-art equipment our 12,000 sq ft. fully enclosed facility uses patented processes to produce a sweet and pleasant tasting stand alone concentrated noni product. This facility enables Noni Maui to be the primary processor and manufacturer of premium quality, standardized Hawaiian Noni ingredients for the natural product and beverage industries, including bottlers, manufacturers, and wholesalers without having to ship to the mainland for such processing. For more than 15 years Noni Maui has been providing consumers with the highest quality Hawaiian Noni on the market. The company ships both air and sea containers to mainland US, Europe, and Asia.